Flatbread pizzas make me so happy! These are no exception. The hummus flatbreads can be served as a quick main dish or as an appetizer. Gluten-free: Use gluten-free flatbread or pita or your favorite gluten-free pizza crust. Paleo: Use cauliflower pizza crust or Paleo-friendly flatbread. Make your own Paleo-friendly hummus with zucchini. Omit feta cheese. 2. Heat about 1 Tbsp of olive oil in a medium skillet over medium-high heat. Add sliced pepper and asparagus and season with salt and pepper. Cook about 5-7 minutes or until crisp and tender. 3. Drizzle each flatbread with olive oil and sprinkle with rosemary and salt. 4. Place flatbreads on cookie sheets and place in the oven for 3-5 minutes, or until hot and beginning to brown on top. Remove from oven. 5. 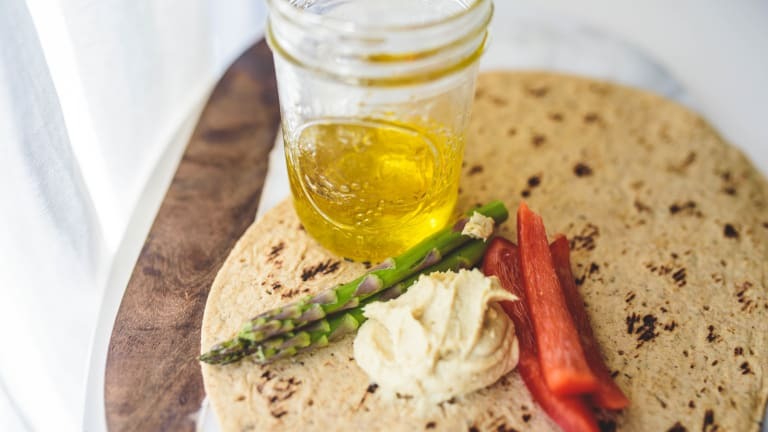 Spread each flatbread with a layer of hummus. Top with red pepper, asparagus and feta.